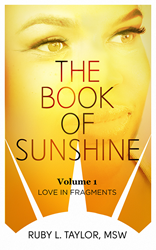 Ruby L. “Sunshine” Taylor, author, filmmaker and activist, today announced the official release of her autobiography, “The Book of Sunshine”. Inspired by her own real-life events, Taylor’s book takes readers on a journey of self-discovery, including moments of trauma and leaving her conservative southern roots to find peace with her sexuality, which ultimately led her to reconcile her spirituality. With her groundbreaking blend of memoir, poetry and photography, Taylor shows readers that no matter what obstacles they face, the sun will shine again. Born in the Bronx, New York, Taylor was raised with strong southern roots and given the nickname “Sunshine” by her mother. With her passion for photographing the sun, Sunshine has been empowered by remarkable resilience in the face of overwhelming adversity. Surviving sexual abuse, a speech impediment, her brother’s murder, a traumatic brain injury, and the process of coming out as a lesbian at 39 years old has tested Sunshine’s incredible strength. Through these struggles, she demonstrates that digging deep, facing one’s truths, and embracing God’s unconditional love can ultimately help anyone thrive and find the sunshine that awaits. Sunshine is currently preparing for her upcoming Kickstarter campaign to assist in the launch of “The Book of Sunshine”, which is currently under development for print. However, readers can sign up now to receive a special discounted price. More information about Ruby L. “Sunshine” Taylor and “The Book of Sunshine” can be found by visiting RubyLTaylor.com/. Ruby L. “Sunshine” Taylor is a proud graduate of both Howard University and Virginia Union University. Today, she lives in Baltimore, MD and Lancaster, PA with her partner and two children. For more information, please visit RubyLTaylor.com/.